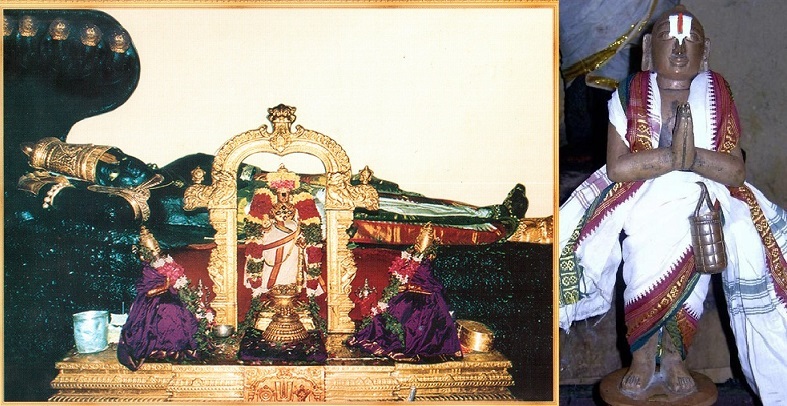 The vyAkhyAtha (commentator) has given the connection of each pAsuram with the previous pAsuram, for all the 45 pAsurams in this prabandham. Instead of aiming for a benefit at random, the thirunAma sankIrthanam that he composed with reciting itself being the benefit, enabled AzhwAr to keep his feet on the heads of yama and his followers, says the AzhwAr in he first pAsuram. For one who is enjoying the sweetness of thirunAma sankIrthanam, even paramapadham is not required, says the AzhwAr in the 2nd pAsuram. He does not want birth in samsAram which is a hurdle for reciting thirunAma sankIrthanam, confirms the AzhwAr in the 3rd pAsuram. Even when sinners such as kshathrabandhu are qualified to recite the divine names, the samsAris are losing out on that and are suffering, says AzhwAr in the 4th pAsuram. Those who desire lowly and transient pleasures in the samsAram such as enjoying the company of women etc are fooling, he says in the 5th pAsuram. He mentioned about the unsteadiness of those who go after such pleasures, in the 6th pAsuram. He advised those who tried to follow philosophies which went against vEdhas such as bhaudhdha, samaNa etc and reach mOksha, that only chakravarthi thirumagan (SrI rAma) is apt to be taken refuge under, in the 7th pAsuram. In the 8th pAsuram, he said that killing those who did not accept the above, but went ahead in abusing emperumAn, would be beneficial both to them and to the world. In the 9th pAsuram, he told those who were willing to accept his words but said that it is difficult to attain SrI rAma, to hold on to kaNNan, who is very simple. When they said that kaNNan is not present now, AzhwAr told them to hold on to periya perumAL who is none else than kaNNan himself, in the 10th pAsuram. In the 11th pAsuram, he said that those who did not take refuge under periya perumAL lacked the grace of emperumAn even when they were in the womb. Even if he had been able to attain periya perumAL, he feels saddened at the sufferings of other samsAris who are not able to attain him, in the 12th pAsuram. In the 13th pAsuram, he wants the samsAris to say “thiruvarangam” in order to uplift themselves. To get over the weariness of having counselled samsAris, he recites the divine names of thiruvarangam in the 14th pAsuram. In the 15th pAsuram, he mentions about the knowledge created by emperumAn about the natural relationship that he has with him. In the 16th pAsuram, he mentions how his devotion grew in proportion to the huge bhagavath vishayam. In the 17th pAsuram, he mentions how one of his senses, eyes, without even expecting him, fell over bhagavath vishayam and enjoyed. In the 18th pAsuram, he mentions how the enjoyment of his eyes led to flooding of his eyes with tears of joy. In the 19th pAsuram, he mentions how his body, which is insentient, involved with bhagavath vishayam like a sentient entity and melted. In the 20th pAsuram, he says that those who know of their relationship with thiruvarangan and his beauty will not leave him. In the 21st pAsuram, he says that he cannot measure the greatness of emperumAn with his heart. In the 22nd, he says that he cannot measure emperumAn through his speech. In that case, one can live forgetting him. But it is not possible to forget him, he says in the 23rd pAsuram. In the 24th, he says that his affection towards emperumAn is deceitful as it is not commensurate with emperumAn’s greatness. In the 25th pAsuram , he says that he does not have karma, gyAna, bhakthi yOgams which have been mentioned in SAsthras. In the 26th pAsuram, he says that he does not have means for mOksham such as worshipping and praising emperumAn, which are common for all, including women and 4th varNa people. In the 27th pAsuram, he says that he does not have the good thoughts that animals such as monkeys and squirrels had (in helping emperumAn). When the elephant [gajEndhrAzhwAn] was in distress, he had full faith in the means, and AzhwAr says in the 28th pAsuram that he did not have that too. In the 29th pAsuram, he says that he does not have the distinguishing connection with a dhivyadhESam. In the 30th pAsuram, he says that not only did he not have any good things in him, he also had many bad things, such as harming others, in him. He says in the 31st pAsuram that he became persona non grata for his relatives who have been with him for many years. Having no good things, and having all bad things in me, I still came and stood before you, because I am a fool, says the AzhwAr, in the 32nd pAsuram. The reason for this is that I have no shame in me, he says in the 33rd pAsuram. Since such a person as I should not reduce the greatness of emperumAn (like poison being added to milk), I decided to leave, he says in the 34th pAsuram. Due to his quality of simplicity, emperumAn took me back, when I tried to leave him, says AzhwAr in the 35th pAsuram. Since that did not happen, he feels sorrowful, in the 37th pAsuram. Once periya perumAL looked at him with comforting eyes, AzhwAr asks him “do you have so much of affection towards your follower who wants to attain you, through you as prApyam (goal) and prApakam (means)?” in the 38th pAsuram. In the 39th pAsuram, he says that those who have this knowledge will not have any shortcoming because of being born in low birth. Such people will not suffer because of earlier sins (such as harming others) that they may have committed, in the 40th pAsuram. They will also sanctify those with whom they are in touch, he says in the 41st pAsuram. They are also apt to be worshipped like emperumAn, he says in the 42nd pAsuram. Those who abuse them because of their low birth or behaviour, even if they are born in high birth, will become like wretch, says the AzhwAr in the 43rd pAsuram. By indicating the great advantage that an elephant had, which even brahmA et al could not derive, AzhwAr talks about his own advantage, in the 44th pAsuram. AzhwAr, in the 45th pAsuram, divines on the benefit that one would get by learning this prabandham. That brings us to the end of exposition on thirumAlai sangathi. This entry was posted in mudhalAyiram, thirumAlai on December 12, 2016 by T N Krishnan.